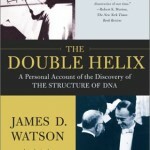 I recently came across a copy of “The Double Helix” by James Watson and will put forth some highlights in this post. The book became quite famous for giving a glimpse of how science was done in the ’50. However it also generated a fair amount of controversy because of the harsh personal attacks especially towards Rosalind Franklin, who made essential contributions but was never acknowledged to the extend of Watson and Crick. The whole discovery of the double helix actually got kick started by the Noble prize winning research of Linus Pauling on the α-helix in proteins1. In the spring of 1951 Pauling published a series of articles1,2 describing the peptide bond is a planar one and predicts proteins partly fold up as α-helices. The main helix article, Watson also refers to in his book, can be found here and the article he jealously refers to that has the opening line “Collagen is a very interesting protein” can be found here. Without explicitly stating, Watson admires Linus Pauling his achievements of the α-helix. It becomes apparent throughout the whole book the elegant α-helical shape, but also the model building method Pauling used, were a major inspirational source for the construction of the double helix in DNA. Watson also gives a very interesting insight in the scientific progress and all the failed theories that are developed along the way. Luckily some remnants are still visible and Watson is also not ashamed to admit the mistakes but also greedily points out the error of others (Pauling for example). One big misstep by Watson and Crick is the hypothesis the two strand of DNA are hold together by a salt bridge of Mg2+ in the middle and the negative phosphate groups pointing inward (see Figure 1). Franklin is the first one to point out the crucial reflections in the X-ray photos for the magnesium ions are missing and the model is thus one big joke. Without giving too much away of the book there is also a very compassionately written chapter that deals with the almost-scoop of Pauling on the structure of DNA. Unfortunately for Pauling he is totally wrong because he postulates in the spring of 1953 (about two years after his discovery of the α-helix in proteins) that DNA is buildup of 3 intertwining helixes with the phosphate groups pointing inwards (see Figure 2), with a chemistry trick he made sure there was no negative net charge on the phosphate groups. However this trick was not part of good-chemistry-practice and soon the whole world (to Watson’s delight) knows the great Pauling is wrong. It is particularly interesting that this fundamentally wrong article3 of Pauling can still be read on the website of PNAS, history really comes alive here. 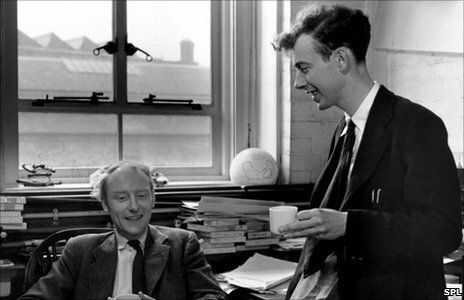 As I already mentioned the whole manuscript is written from Watson’s viewpoint, to get a small peak on the thoughts of Francis Crick check out this small autobiographical article of Crick6. The original DNA paper4 can be found here and a follow up published a couple of weeks later about the biological implications5 can be found here. In conclusion I can really recommend the book, it is entertaining, form time to time hilarious, gives new insights in history and as Sir Lawrence Bragg states in his foreword it should be read with a “very forgiving spirit”. Luckily Watson also has some reassuring words for PhD students working in Denmark: “The $3,000 fellowship stipend that I had received for being in Copenhagen was three times that required to live like a well-off Danish student”. 1. Pauling, L., Corey, R. B. & Branson, H. R. The structure of proteins: Two hydrogen-bonded helical configurations of the polypeptide chain. Proceedings of the National Academy of Sciences 37, 205–211 (1951). 2. Pauling, L. & Corey, R. B. The Structure of Fibrous Proteins of the Collagen-Gelatin Group. Proceedings of the National Academy of Sciences 37, 272–281 (1951). 3. Pauling, L. & Corey, R. A Proposed Structure For The Nucleic Acids. Proceedings of the National Academy of Sciences 39, 84–97 (1953). 4. Watson, J. 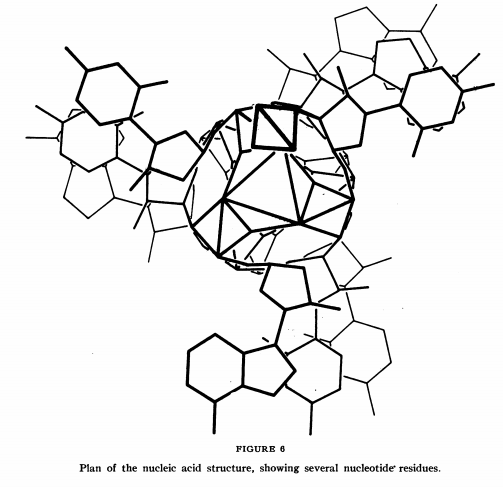 & Crick, F. Molecular Structure of Nucleic Acids: A Structure for Deoxyribose Nucleic Acid. Nature 171, 737–738 (1953). 5. Watson, J. & Crick, F. Genetical implications of the structure of deoxyribonucleic acid. Nature 171, 964–967 (1953). 6. Crick, F. The Double Helix: A personal view. Nature 248, 766–769 (1974).